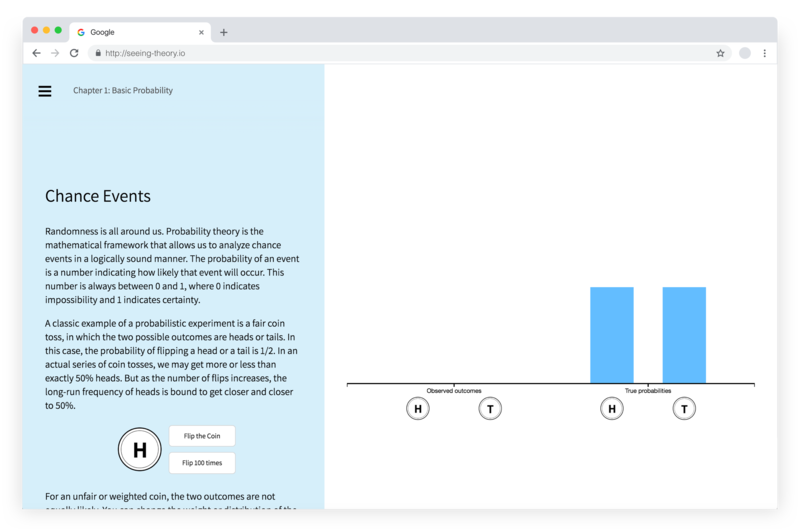 Seeing Theory.io is an educational website that makes the field of statistics more accessible by inviting users to explore a collection of fifteen interactive web visualizations. Each presents a bite-sized concept that is commonly encountered in a standard introductory statistics curriculum, from random variables to chance events. • During peak traffic, received more than 150,000 unique page views daily. • Made it to the front pages of Reddit and Hacker News. • Won a Webby award in Education. As a designer, I created the UX flow of the website, and defined the visual look and feel. As a front-end developer, I coded the website interface from scratch, translating my design mocks into visually pleasing and responsive website. My collaborators focused on content and visualization.